Orzhov Pontiff is a relatively simple effect with a lot of extraneous complexity due to the haunt ability. It was nonetheless one of Guildpact‘s notable cards, at least for a while, because the prevalence of Orzhov-colored decks with smallish creatures let it function as a mirror match breaker, potentially sweeping away herds of Spirit tokens and Dark Confidants. The rise of Nantuko Husk also gave the Pontiff’s controller a lot more control over when and how it was used, not to mention giving Orzhov players headaches trying to keep track of their haunt abilities, their opponent’s haunt abilities, both players’ Nantuko Husks, and so on. I think Modern is a little fast for it right now, but then again, Lingering Souls is always around, and you potentially have two triggers to go with two castings of that spell . . . 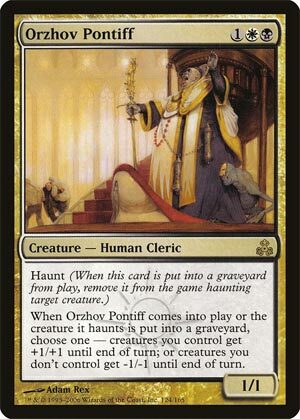 Probably one of the seemingly less-likely cards to see Modern play, Orzhov Pontiff has sort of popped up as a one-of in various decks for some time now, to where the card holds surprising value for being a seemingly janky rare from a very old set (about $6) with yet to see a reprint of any kind. You’re obviously not playing the Pontiff for his body (a 1/1); you’re playing him for his effects. You get one half of Zealous Persecution when he comes into play…or when his haunt effect goes off. Haunt was the Orzhov mechanic from Guildpact, giving a trigger when it came into play (or was cast) and when the creature it haunted died. So you’d usually get a second shot of Orzhov Pontiff. But while Zealous Persecution sees almost no play in Modern, Orzhov Pontiff pops up from time to time. This is because he is a creature and is also, conveniently, a Human creature with a good converted mana cost (3). He gets hit off of Collected Company, he’s an option for a three-charge Aether Vial, and he was part of Birthing Pod strategies before it was banned. So, yeah…it doesn’t seem like a lot, but the Pontiff is good in several decks, offering a unique mix of abilities to hold various decks together; he’s rarely more than a 1-of silver bullet, but he is quite a bullet indeed.